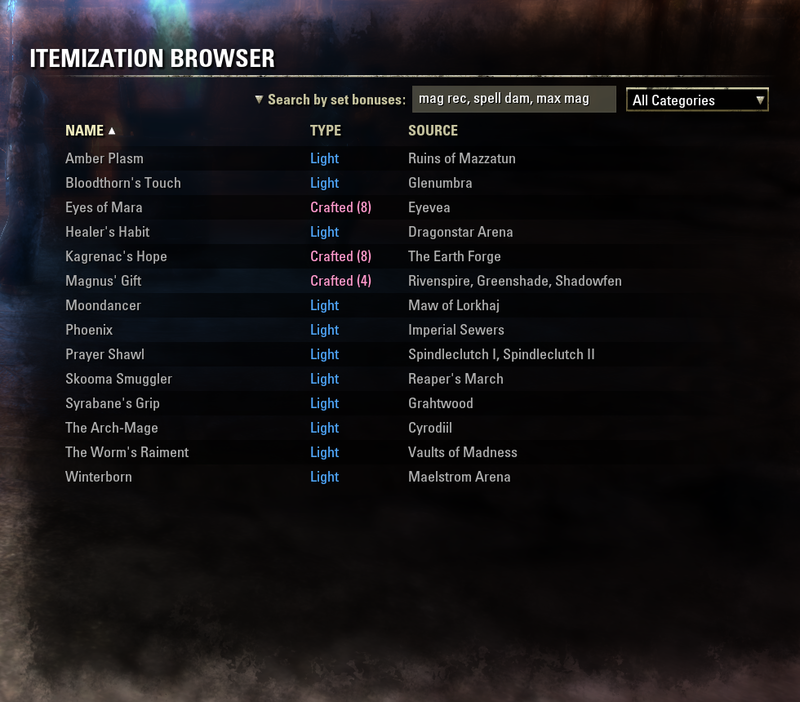 What is Itemization Browser and what does it do? 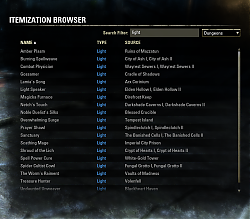 Itemization Browser lets you browse and view all of the game's available item sets in-game. 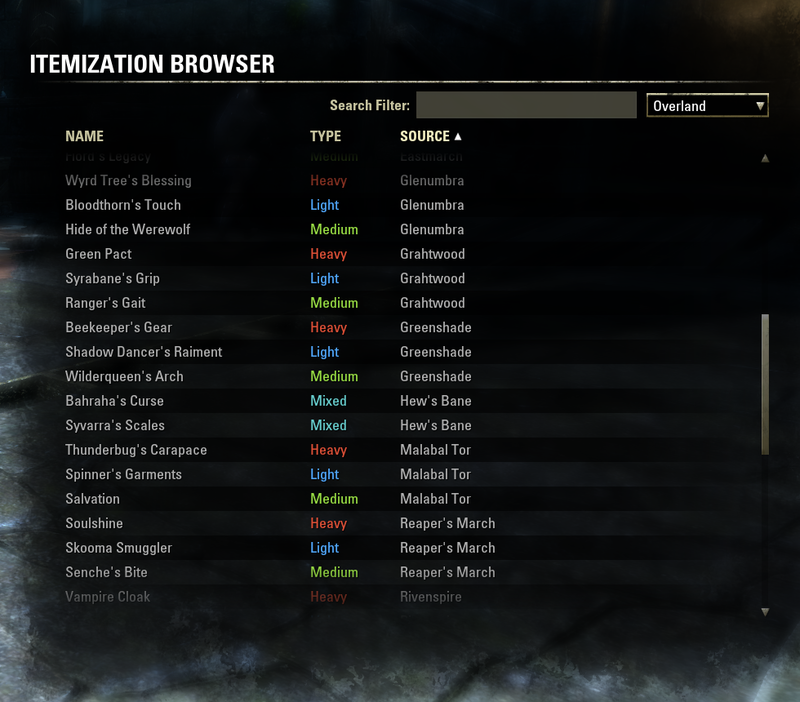 With One Tamriel's massive overhaul of itemization, it's difficult to keep track of what each item set does and where it can be acquired. 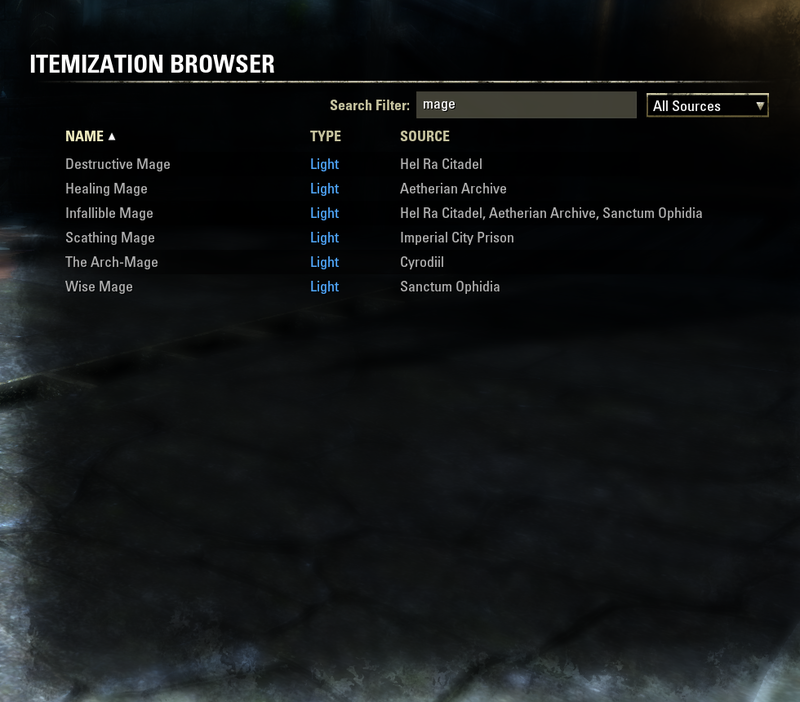 This addon is designed to help you with that. 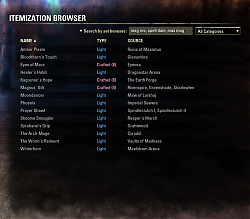 All of item sets obtainable in the game, including the arena weapons, are listed and browsable. 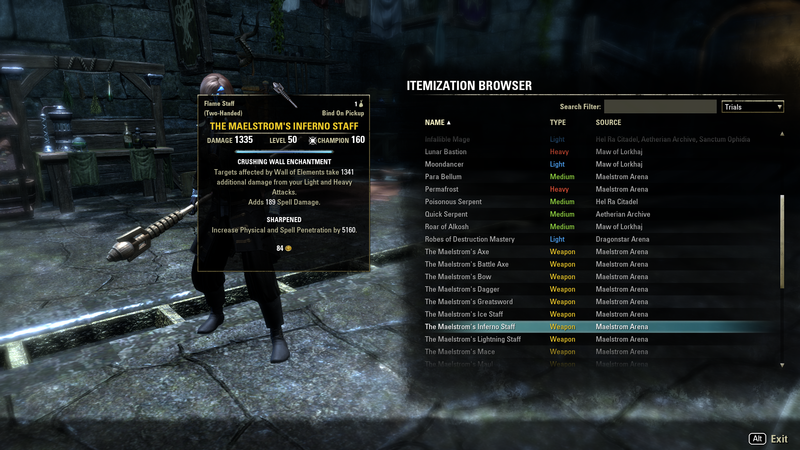 Hover over a set with your mouse to see the in-game tooltip for a sample item of that set. Click on a set to link into chat a sample item of that set. You can sort by name, type, and source of the item. Once opened, you can view a set simply by hovering your mouse over it. Clicking on a set will post a link to chat. You can sort by name, type, or source by clicking on the appropriate header. You can use the drop-down box to filter by the general source type. And finally, you can also use the text search filter to narrow things down. 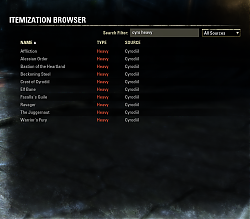 For example, if you type "cyro heavy" into the search filter, it will display the heavy armor sets that can be acquired from Cyrodiil. To search for sets by their set bonuses, click the dropdown arrow to change the search mode to "Search by set bonuses". You can search for multiple bonuses, if they are separated by either a comma (",") or a plus sign ("+"). 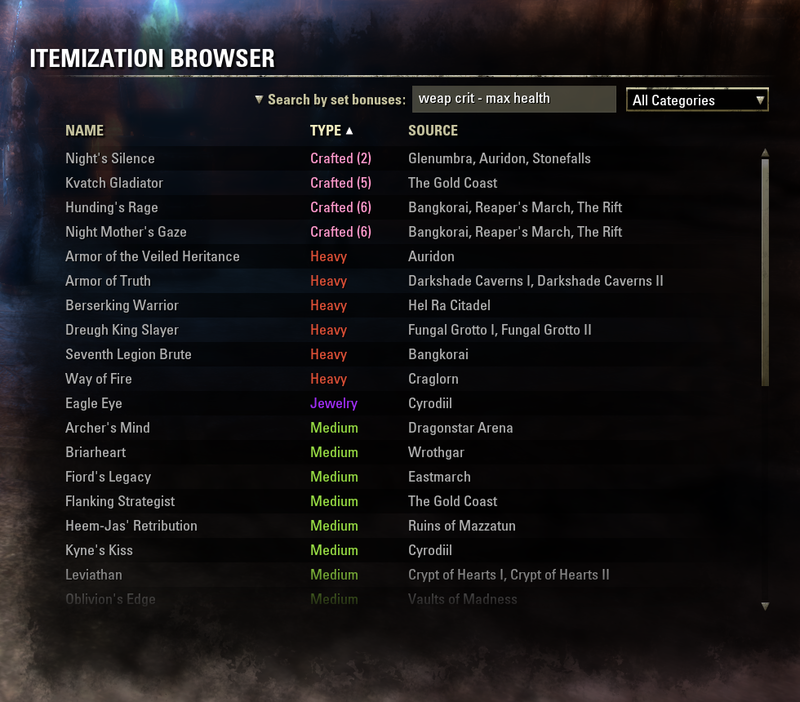 For example, a search for "mag rec, spell dam, max mag" will match all sets that have magicka recovery, spell damage, and max magicka. As another example, a search for "weap crit + max health" will show all the sets that have both weapon critical and maximum health bonuses. Alternatively, you can exclude a set bonus by using the minus sign ("-"). So if you change "weap crit + max health" into "weapon crit - max health", then you will be shown a list of all the sets that grant weapon critical without any maximum health bonuses. The search will match even if there are intervening terms, and it also follows the ordering. For example, a search for "spell damage" will match bonuses that say "Spell and Weapon Damage" (the "and Weapon" does not disqualify the match), but it will not match "damage from enemy spells" (since "damage" in this case comes before "spell" instead of after). Renamed the "Alliance War" category to "Player VS Player"
This operator can be used for either the general search or the set bonus search. That's what the set bonus search is for. Unless you are proposing something that's manually curated, which I have absolutely no desire to implement. 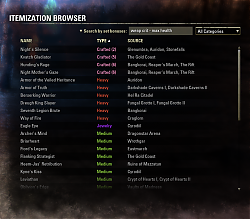 The current system of searching the in-game set bonus text means that things are automatically kept up to date as sets are revamped each patch, and that things are always properly localized, as players using clients in other languages will automatically be searching text in those languages. 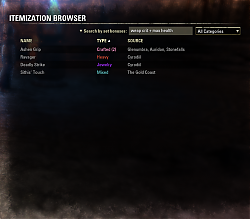 I already use Votan's Keybinder, however, the issue is that the option/line/whatever-you-want-to-call-it where you would enter a keybind doesn't exist for me under either of the 2 submenus. 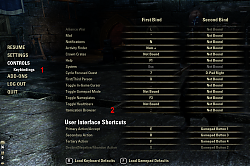 Luckily, I found a mod that will let me create custom slash command shortcuts (Harven's Aliases) & that'll do for now. 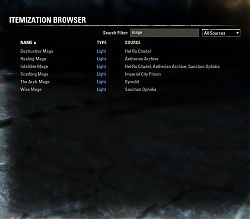 I just installed this addon & was trying to find a way to open it. Last edited by Onigar : 12/04/18 at 05:42 AM. however, said keybind slot is not present for me. I get no LUA error either. I can use the /itembrowser command to open the mod, however, that's nowhere near as convenient as a keybind. 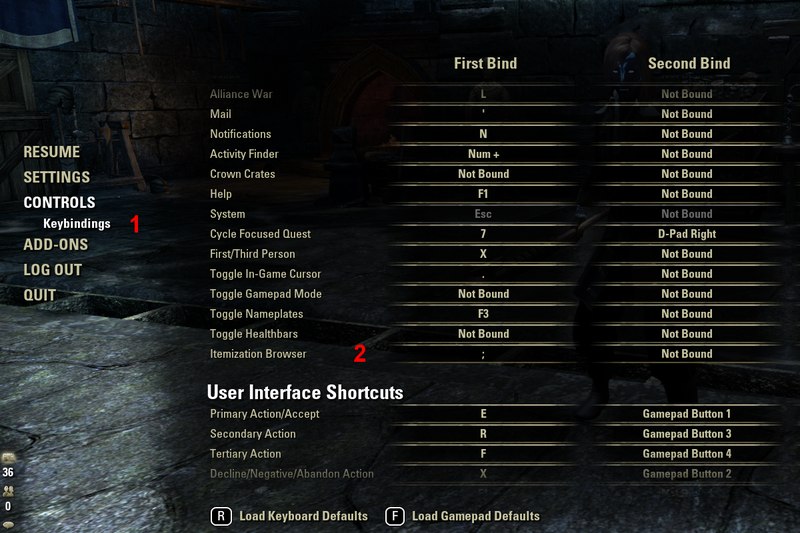 I also don't understand why the keybind placement wouldn't be under the "Addon Keybinds" section with the rest of the addon specific keybinds, however, I suppose I don't need to know this. Perhaps mine is an isolated instance & it's some sort of conflict with another mod that just doesn't generate an error. In any case, I would greatly appreciate any constructive thoughts anyone has regarding a solution. Should translate to "Unerschrockene" in German e.g. I had already switched to GetString("SI_VISUALARMORTYPE", VISUAL_ARMORTYPE_UNDAUNTED) for the English version in 1.1.12. I didn't change the French or German versions because the translation text was too long and had poor visual fit. I might reconsider this decision in the future, though. Last edited by code65536 : 10/22/18 at 12:40 PM. Last edited by Baertram : 10/07/18 at 12:08 PM. 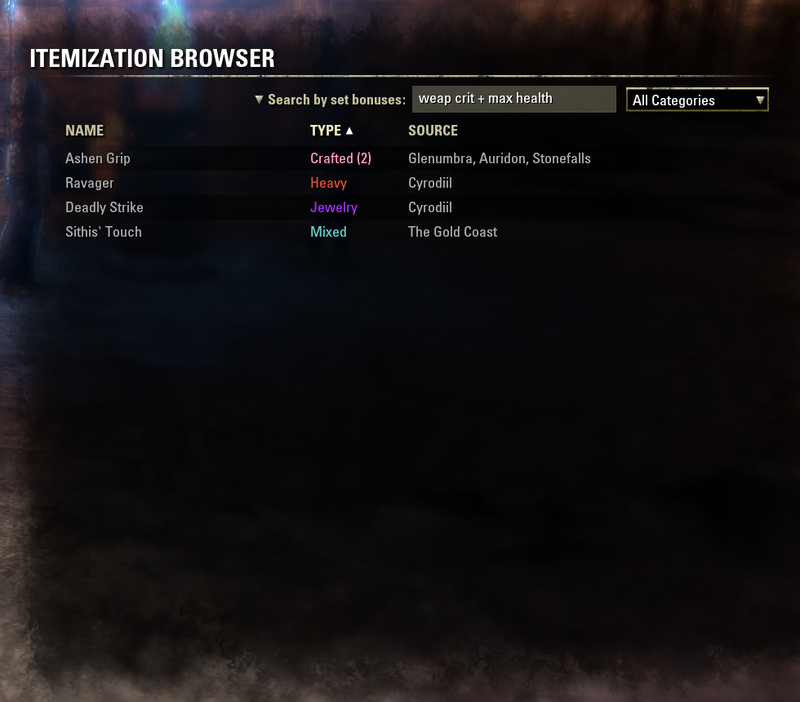 Pretty much all the named items--quest rewards, dungeon drops, etc.--that you used to decon and vendor are now set items. And there's a lot of them. 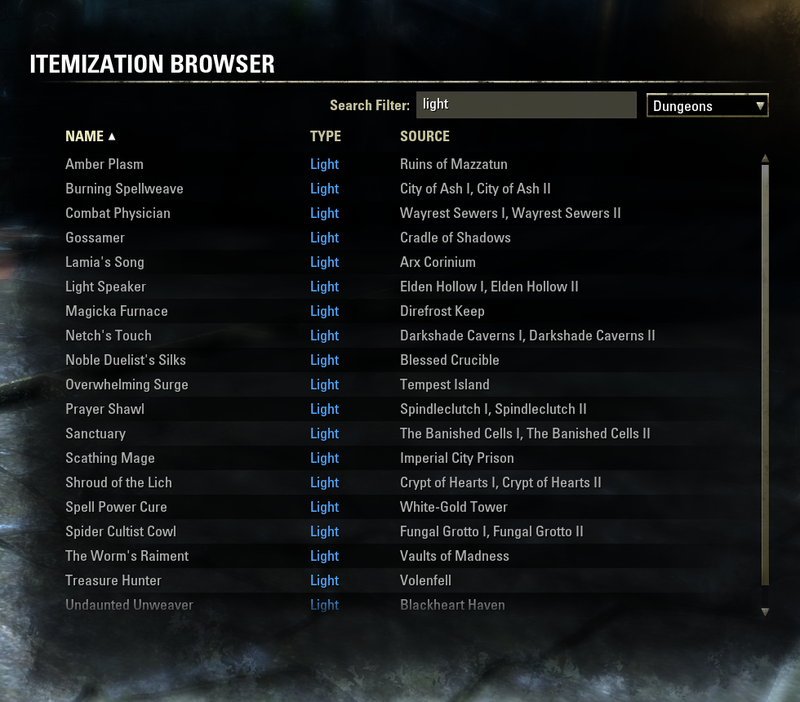 In response to some requests, I'm mulling the idea of adding a feature to Itemization Browser search the game's data for items matching a selected set. The inclusion of these named items can change the outlook for some of the sets. For example, Rattlecage being a heavy armor and healthy jewelry set is a set that most people would dismiss out of hand. But the existence of Arcane named jewelry means that if you pair that with a weapon, you can do that set in a 5/1/1 setup and avoid all the downsides of it being heavy/healthy. (It's still a lackluster set, though--this is just an example I thought of off the top of my head.) That said, I'm not sure if I would actually add such a feature since it could turn out to be rather unwieldy. Japanese has it been translated? I just want to check it out, but if you can, I'd like to ask you to translate Japanese. Last edited by Siegtime : 09/19/18 at 07:19 AM. Hello! 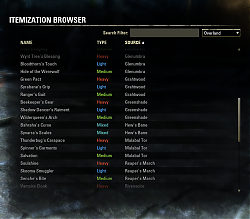 I have interesting (in my opinion) idea for your addon. Simple, but may be usefull. Add into item tooltip info about set source. For "Wise Mage" it will be string in the tooltip: "Trial: Sanctum Ophidia". It will be usefull if someone link you some set. You are open tooltip and can see where drop this set!